Maximum forage diversity without ryegrass. Non ryegrass pasture provides a diverse range of grass species yet completely removes the elevated sugar/protein content of modern, improved, rich (and even tetrapolid) ryegrass varieties which are so often included in cheaper mixtures and yet clearly associated with easy weight gain and/or the increased risk of equine laminitis. 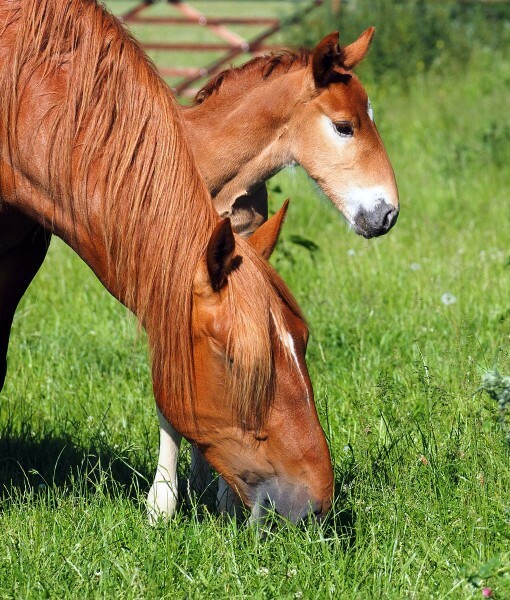 We have added perennial pasture herbs to our Non Ryegrass Equine Pasture mixture to provide additional natural vitamins and minerals to the diet of any grazing horse, alpaca, llama, pony or mixed grazing with sheep compared to that of a 100% grass only diet. One of the main benefits of establishing pasture herbs in a paddock or grazing pasture is a greater depth of soil is permeated by tap roots. This in turn encourages the extraction of moisture, nutrients and minerals from much lower in the soil strata. Critical trace elements can also be lifted to the surface into the stems and leaves of herbs which (usually) are readily consumed by foraging equine animals and/or sheep. The area/s to be sown should be cultivated to produce a firm, weed free seedbed clear of large stones, roots and any other loose debris. Harrow or rake over the surface to create a thin layer of fine, loose soil (tilth) approximately 10- 25mm (1/2” – 1”) deep. Evenly machine broadcast the horse pasture seeds at 14.00 kg per acre (35.00 kg per hectare 3.5 grams per square metre). Please allow double the seeding rate if sowing by hand. After sowing, gently work the applied seeds into the loose tilth a little with a light harrow or firm rake. Finally, use a light weight (for clay ground) to medium weight (free draining ground) flat roller to squeeze the seeds and tilth down into the prepared seedbed.